LightFlex daylighting system uses a prismatic skylight to capture low-angle sunlight and optimize light distribution. Optic sphere is designed to drive light down through the skylight to maximize light penetration. System comes standard with an insulated square roof curb. Available in 21-inch tubular as well as 2-by-4-foot and 4-by-4-foot models. 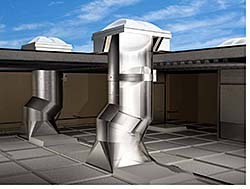 Larger unit options allow for fewer penetrations in the roof; tubular device includes adjustable elbows to bypass interior ceiling obstructions in retrofit applications. Light control louvers allow users to adjust the amount of daylight entering the room.